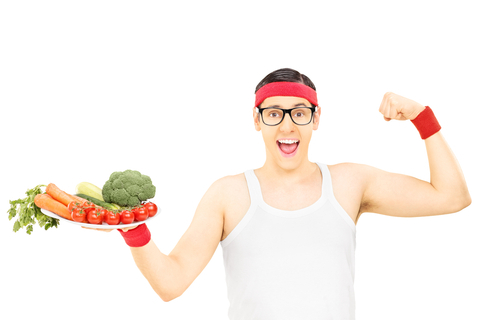 When you think of building muscles, vegetables are probably the last food group that comes to mind. A thick grass-fed steak, a couple of free-range eggs or even a whey protein shake … these are the types of foods that truly build muscles, right? Yes, they certainly do … but they’re not the only ones. And if you’re overlooking veggies as part of your muscle-building arsenal, you could be missing out. Your muscles need vitamins, don’t they? And minerals? And antioxidants? Yes, yes, and yes … and where do you find such treasures? You could take a multivitamin … but this wouldn’t even come close to the bounty that a plate of fresh vegetables provides. Do your muscles a favor and eat yours up with every meal, especially these proven winners when it comes to building muscle health and more. Diets high in potassium-rich produce have an alkalizing effect that may help preserve muscle mass. [iv] As you age, metabolic acidosis tends to occur that triggers a muscle-wasting response. But those who ate the most potassium-rich diets maintained 3.6 more pounds of lean tissue compared to those with half the potassium intake. Sweet potatoes topped the list of potassium-rich veggies, but there are many others as well, like spinach, broccoli and Brussels sprouts. So get munching on those vegetables !! What Does Epsom Salt Do for Soreness?